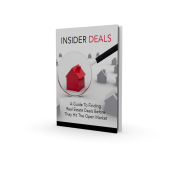 Complete this form to be added to our "Hot List" and get immediate access to your FREE copy of our new report, "Insider Deals - A Guide to Finding Real Estate Deals Before They Hit the Open Market. Join our community! Follow us on Facebook for daily updates and more.